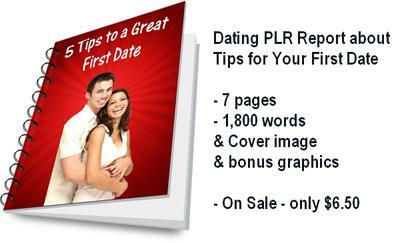 "5 Tips to a Great First Date - How to Increase your Enjoyment as well as the Chances of a Second Date"
This Dating PLR Report is 7 pages long, 1,800 words to use for building your subscriber lists or site content. Includes Report Cover graphic and 10 bonus images to use in the report when you publish it, or to put on your site/blog to make your pages POP! "When to Call Her Again"
If she appeared to have fun and maybe even told you she’d like to see you again, you have to decide how long you want to wait before you call. Some guys will tell you to wait a week so you don’t appear desperate. Others will say to call her the next day so she knows you are interested. Really, all it boils down to is what YOU want to do. It’s not a good idea to rush home and call her as soon as you walk in the door. You may want to wait a day or two just so she can have time to evaluate the first date and truly decide if it could work between you two. It also wouldn’t hurt for you to think about how the date went. There may have been things that you didn’t notice at the time that you will think about later. Be sure that you do want to see her again if you make the phone call. Waiting a couple days will also allow both of you to start missing each other, making the second meeting even better. REMINDER: This report is exclusively available from my store only. If you should experience any problems with your download, you can Contact us or first check the FAQ page to see if it has your answers. Grab my free report here that covers How Do You Use PLR To Slay Your Competition? It will give you heaps of ideas for the creative use of PLR on your site and for content to use in your Search Engine Marketing campaigns.